Explore some of Chile’s beautiful scenery on a trip to Santos Lake and Peulla. 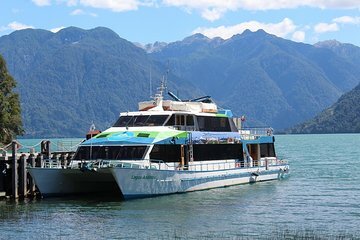 This full-day tour includes a trip to the Petrohue waterfalls and a 2-hour boat ride on Santos Lake to admire the Osorno Volcano. Then head to Peulla where you can choose from a number activities including canopying, horseback riding, a 4x4 safari, or simply relax on the lake and soak up the views. Pick up is from the direction of Salvador 72, Puerto Varas. you must approach this meeting point. A wonderful day out enjoying fantastic scenery and sights. The catamaran trip on Santos Lake was very comfortable and the scenery gorgeous. Puella was lovely, a hidden gem and so interesting. This Tour was very good, the guide was great and it was a good experience.